The root canal is the hollow area at the center of a tooth. In dentistry, a pulpectomy is an endodontic treatment to cure an infection of the root canal; informally a root canal. A root canal, coupled with internal tooth bleaching, is also used to fix teeth that have blackened due to infiltration of decayed soft tissue into the dentin in the teeth, most often seen in frontal incisors that have been injured through a sudden impact. At the center of a tooth is a hollow area that houses soft tissue, known as pulp. This hollow area comprises of a relatively wide space towards the chewing surface of the tooth called the pulp chamber. This pulp chamber is connected to the tip of the root of the tooth via thin hollow pipe-like canals�hence, the term "root canal". These canals run through the centre of the roots like pencil lead runs through the length of a pencil. The tooth receives nutrition through the blood vessels and nerves traversing these canals. Occasionally, a cavity on the outside of the tooth may allow this soft tissue to become infected. If left untreated a serious jaw infection can result. The infection and inflammation is very painful in most cases. Ideally treatment should take place before this happens. Inside each tooth is a pulp chamber that contains the nerves and blood supply for the tooth. 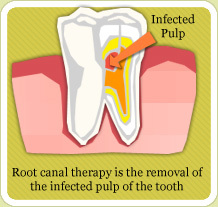 When the pulp becomes infected due to decay or injury to the tooth, the pulp must be removed from the center of the tooth and the canals of each root. Once the infected pulp is removed, the remaining chamber is filled with a rubber-based material to seal it off. All teeth that have had root canal therapy must be protected with a tooth-like artificial covering known as a crown (see crown section.) This is because teeth that have had the pulp removed are more susceptible to fracture.